Last month, we introduced scripting functionality in ReadySuite, and this week, officially released ReadySuite v6.0 with a built-in script library. Featured categories include date tools, file tools, metadata tools, PDF tools, and quality control tools. We’re now shipping with 22 scripts and will continue to add useful scripts to help drive daily tasks. Early in development, we were undecided on whether scripting was the best name to release it under. ReadySuite has a healthy balance of non-technical and technical users – and initial concern was scripting would be viewed as too technical to use or overlooked as an important feature set. We played with the idea of naming it “Actions”, “Macros”, “Tasks”, and yes, even “Tools.” Ultimately, this focus shifted towards both presenting scripting in a way that made it easy to use, with the user never seeing source code, and separately, a script editor for technical users to control the entire process. With that covered, let’s start taking a closer look at some built-in scripts. We added this feature so you can easily convert the time zone of a date in one locale to another. The example below shows converting a DATESENT field from EST time to UTC time. You can select any source time zone and any destination time zone to convert the date from and to. This script will soon be extended to handle the conversion of more than one date at a time. Creating a sort-able date field is often a common task in eDiscovery. In ReadySuite, previously to v6.0, users could use our Batch Update combined with the “Propagate to Family” option turned on. However, it might involve several steps if you wanted to prioritize certain date values. Now – in ReadySuite v6.0 – the ‘Sort Date Creator’ script allows you to select multiple date values, the date format, and the script will output (factoring in document family/groups) the desired sort date. Running the ‘Field Statistics’ script is an easy way to see which fields are fully populated down to the fields that have no data. For example, you might expect the e-mail subject field to match closely with the date sent, date received, and from and to fields. Using this script will help spot possible errors in volumes and productions. Another often seen task in eDiscovery is the need to create your own MD5 or SHA based hash values for documents. Running this script presents the user with the output field name, the hashing algorithm to use, and a list of seven fields that can be used to derive a new hash value. The amount of fields is arbitrary – and you can easily add more to the list. 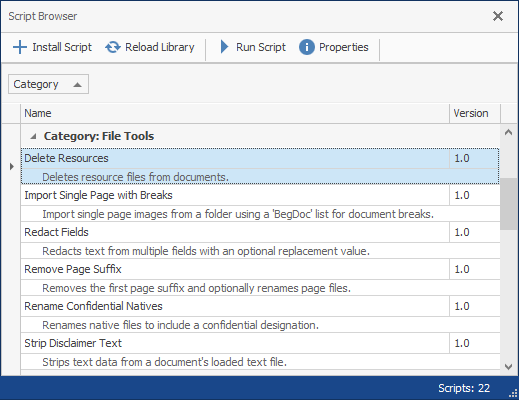 We’ll continue the scripting series next week and we will be highlighting more scripts now available in ReadySuite.